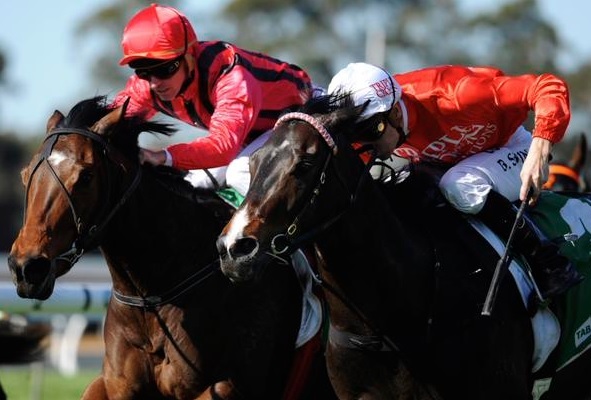 The Peter and Paul Snowden-trained Denpurr prevailed in a narrow photo finish over James Cummings’ second-starter Ocean Tempest at Warwick Farm on Wednesday. Denpurr, ridden by Blake Shinn, started the $5 second favourite in the TAB Place Multi Handicap (1200m) but found stiff competition in $19 chance Ocean Tempest which was coming off a debut win at Gosford last month. The pair hit the line locked together but it was Denpurr adjudged the winner by a nose margin. The Paul Perry-trained Gone To Paris ($15) finished another three-quarters of a length away in third. The Snowdens thought enough of Denpurr to send her to the Group III Ken Russell Stakes (1200m) at the Gold Coast during the winter carnival after an impressive midweek victory at Warwick Farm however the plan didn’t run to script. The daughter of Denman got back in the contest and failed to make an impression around the tricky Gold Coast circuit before returning to Sydney for a spell. “She was still very immature so we tipped her out after that and she’s come back a stronger filly this time in,” Peter Snowden said. “It was a good decisive win, albeit by a small margin. Snowden, who trained the sire Denman to a Group I Golden Rose success, said there are similarities between him and Denpurr. “She’s very similar to her dad, has the same build and make-up,” he said.